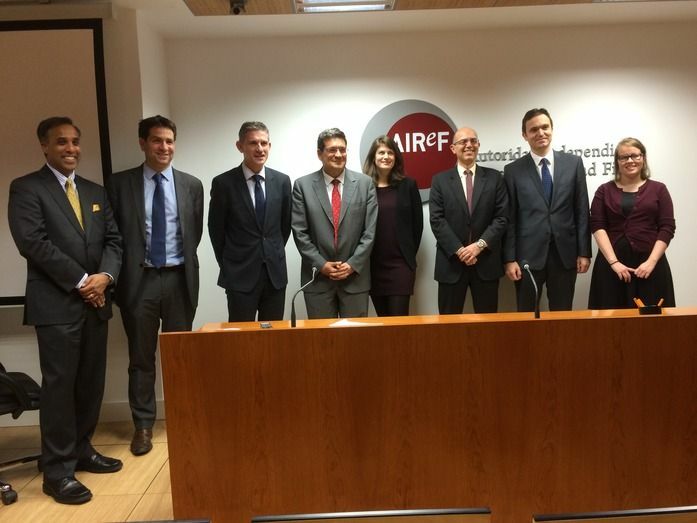 AIReF holds a seminar to analyse the international work of Independent Fiscal Institutions. It is absolutely clear to Independent Fiscal Institutions (IFIs) that the only way to have and maintain the credibility and leadership befitting their role in society is to ensure maximum transparency in everything they do. This was the key conclusion reached in the seminar held by AIReF in Madrid to analyse the work of these institutions as the guarantors of sustainable public finances. The seminar took place on 2nd and 3rd December in Madrid with the participation of speakers from the IMF Fiscal Affairs Department (Victor Lledó and Tom Josephs), the OECD (Lisa von Trapp) and representatives of four IFIs: Bárbara Coppens, Belgian High Finance Council; John McHale, Irish Fiscal Advisory Council; Ludovit Odor, Council for Budget Responsibility, Slovakia; and Sahir Khan, former member of the Canadian Parliamentary Budget Office (PBO). The experts agreed that all IFIs face similar challenges and problems irrespective of their geographical origin. Those problems and challenges range from budgetary constraints to difficulties in gaining access to quality information, as well as the need to achieve an adequate degree of understanding and collaboration with the government sector entities whose budgets their job is to analyse. The solutions to those problems however, must be different. They need to be tailored to the specificities of each different society albeit governed at all times by absolute transparency. Excellent processing and analysis of economic data together with proper communication of the results of that work and of the process involved in reaching them are key factors in the success of IFIs. A strong legal mandate underpinning their creation definitely aids them in this task. Nevertheless, the representatives of the different IFIs also agreed that all pubic entities must be involved in order for the “comply or explain” principle governing the activities of some Fiscal Authorities —AIReF being one of them— to be properly implemented. On this theme, it was noted in the discussions that in some countries with greater organisational decentralization it is much more complex for IFIs to exercise fiscal supervision. That is because, firstly, territorial differences come through into economic development as gaps in regional GDPs. Secondly, because each territory tends to have a different way of processing and giving access to information. In addition, the number of entities and municipalities that could be analysed is much higher. AIReF president José Luis Escrivá thanked all the speakers for their presentations and all those attending for their interest and active participation in this first seminar organised by the institution. He highlighted the importance of exchanging good practices at an international level through collaboration with other IFIs and international organisations. AIReF publishes below the presentations made by the speakers and the final conclusions of the seminar as a way of disseminating to a wider audience the functions and key challenges facing the institution.